The Omnigen is a disc-shaped human derived amniotic membrane dry matrix that can be used as an ocular surface graft or wound dressing. It is a ready to use, ‘off the shelf’ amniotic membrane that aids in the healing of the cornea and acts as a substrate (foundation material) for soft tissue regrowth. This biological matrix offers similar wound healing properties to the AmnioMatrix products. 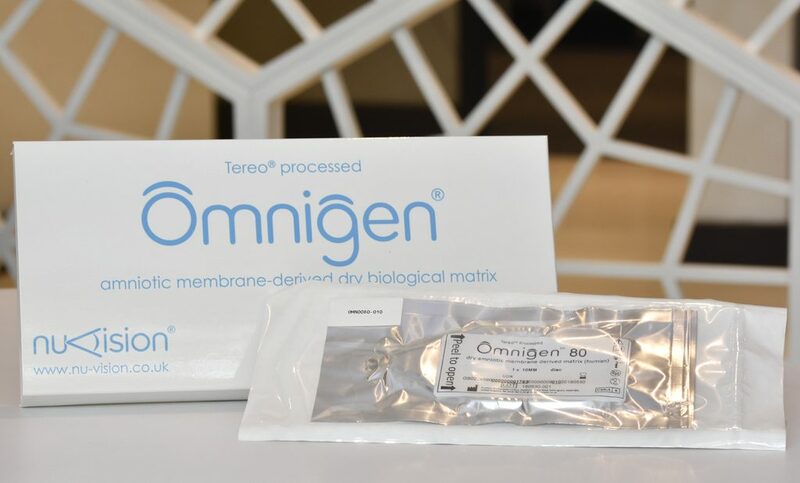 The Omnigen is manufactured using a patented preparation and drying process called Tereo. This process allows retention of the natural trophic components present in fresh amniotic membrane, an element that is believed to be linked to wound healing performance. Omnigen is a stable dry biological matrix that may be stored at the point of care, at room temperature. It is ready to use when clinically required thus it can be routinely accessed in emergency situations. The Omnigen disc is removed from the delivery tray and applied directly to the eye, where it can be rapidly rehydrated by ambient in vivo moisture in the eye with the epithelial side marked for confident orientation. This disc offers surgery and suture-free application. It is placed directly in the eye and kept in place by the OmniLenz contact lens thus minimizing further damage to the ocular surface that is already compromised. OmniLenz is a bespoke contact lens that helps deliver Omnigen therapy without the need for surgery. It is a ready to use ‘off the shelf’ contact lens that conveniently delivers an on demand regenerative therapy for the treatment of a variety of ocular indications. OmniLenz secures Omnigen to the ocular surface without the need for surgery. These two products offer routine regenerative therapy in emergency and in-clinic situations where surgery is not required or not immediately accessible. 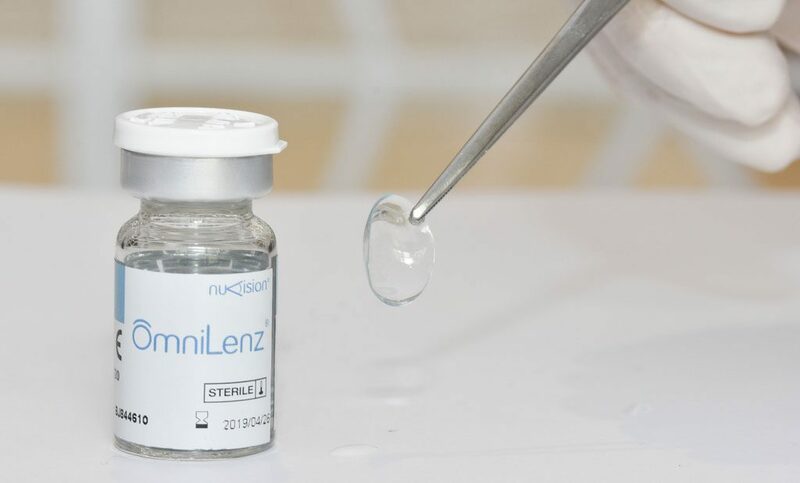 The Omnilenz is a kind of contact lens that is derived from a high-water content soft material contact lens base (Menicon 72%) that sits securely at the ocular surface to provide protection and comfort to the eye, thus allowing effective regeneration beneath. OmniLenz is stored ‘on-the-shelf’ at the point of care. It is available on demand thus allowing rapid and effective treatment of ophthalmic indications, even at first presentation. The use of Omnigen with OmniLenz simplifies the clinical process – this surgery-fee application allows for immediate delivery of regenerative therapy to the ocular surface. Omnigen disc is a 80mm2 , with a 10mm diameter, dry human amniotic membrane supplied in a sterile plastic tray that is packaged inside a sterile transparent Tyvek pouch. It is dry preserved and stable at room temperature up to 25oC until the stated expiry date. OmniLenz is a 16mm diameter bespoke soft contact lens and is supplied in a sterile clear vial filled with 0.9% Borate Buered Saline. It can be stored at room temperature until the stated expiry date.